A nice, easy cake that I have made countless times. It is quick to prepare, and looks magnificent. 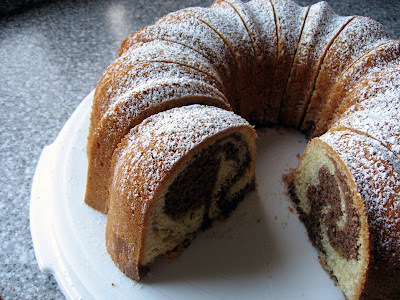 A wonderful coffee cake! 1. Preheat the oven to 350F. 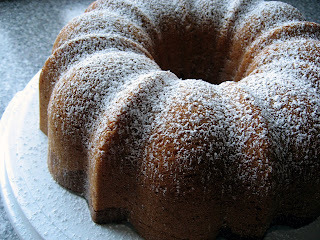 Grease the bundt mould (do this really well). 2. Using a stand mixer set at medium speed with a whisk attachment, cream the butter until smooth. 3. Slowly add the sugar, vanilla sugar, rum and salt while the mixer is still in motion. 4. Add one egg at a time whisking for 30seconds at the highest speed between additions. 5. In a medium bowl using a hand held whisk, combine the flour and baking powder. 6. Add the flour mixture in two stages, alternating with the milk (do these additions at medium speed). 7. Spoon 2/3 of the cake mixture into the bundt pan. 8. With the remaining 1/3, sift in the cocoa powder, add the sugar and 1 Tbs. milk. Combine well until the batter is homogenous – if required add the other 1 Tbs. of milk. 9. Spoon the Chocolate batter on top of the original batter. 10. Use a fork and a swirling motion and drag the fork through the chocolate layer and then through the other batter layer. 11. Put the cake in the oven. Bake for around 60 min. 12. Remove from oven and let it sit on a wire rack for 10min before removing it from the pan. 13. If you like, you can dust the cake with sifted icing sugar. Taken from Dr. Oetker's "German Baking Today: The Original" p.28. Is there anyway you could post the measurements in cups and tablespoons? Sorry Charles - I have no idea how to convert them to cups and tablespoons. Sorry! Your marbling effect looks really nice! And the final presentation too! Thanks for sharing and for posting!